The premium offering in the Elegance line, the Breezy® Elegance Platinum includes the highest level of seating support and adjustability. For those looking for the very best in mobility, the Elegance Platinum is available exclusively at our Premium Retailers. The Elegance Platinum's ultra lightweight frame was designed for personalized comfort and function. Customizable seat heights allow the seat to be lowered for foot propulsion, if necessary. Quick-release wheels may be removed from the frame for storage or transport, and wheel locks are easily accessed at the front of the frame to prevent the wheelchair from rolling forward or backward. Height adjustable push handles allow caregivers to confidently push the wheelchair from a position that is comfortable for them. An integrated drum braking system, operated by locking brake levers located at the push handles, provide the caregiver with maximum control, security, and convenience when descending or pausing on a slope without having to reach for the wheel locks. The Elegance Platinum's height adjustable armrests help to reduce shoulder tension by providing a personalized fit. 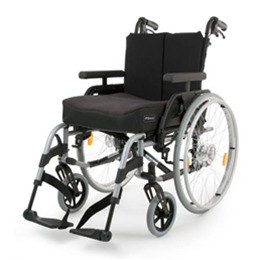 They conveniently flip back, allowing you to transfer in and out of the wheelchair with ease. PLATINUM Seating: Contoured ULTRA Plush Cushion and 7-Strap Adjustable BackrestThe Elegance Platinum offers Breezy's best seating combination. The contoured ULTRA plush cushion provides moderate side to side support and features a Visco™ memory foam top layer for supreme comfort. The extra straps on the 7-strap tension adjustable backrest provide the greatest level of customization to fit the shape of each individual.